Apple's streaming service stands to gain millions more subscribers by opening the Android floodgates. As promised, Apple just introduced a major new app for Android—yes, Android—with the expected arrival of Apple Music. The company’s streaming service looks mostly the same for Android as it does on iOS, and has the same core elements: For You, New, Radio, Connect, Playlists, and My Music. Subscribers on Android will get the same free three-month trial that iOS users did. The app is currently in beta in the Google Play store, but that just means it’s missing a couple of features that launched on iOS, most notably music videos and family membership sign-ups and upgrades. You can still sign up for a family plan on an iOS device or a Mac and then sign in to use it on Android. The app is launching in every country where Apple Music is available for iOS, except for China. Eddy Cue, Apple’s senior vice president of software and services, told TechCrunch that Apple purposefully kept Android design in mind when building the app, making sure to use a hamburger menu at the top and keeping the standard Android share button. We’ll have to wait and see whether Apple Music on Android is as game-changing as iTunes on Windows was, though we’re sure the reviews on Google Play will be just as amazing as they are for Apple’s Move to iOS app. Why this matters: Apple Music has 15 million subscribers, and all of them are on iOS. Now that the service is open to Android users, that number will climb exponentially—or at least that’s what Apple is likely hoping for. 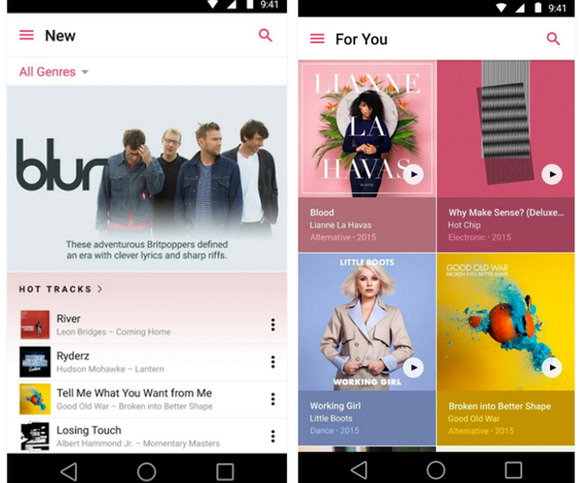 Why would Android users want to use Apple Music? Well, the app puts iTunes music purchases and Apple’s streaming catalog side-by-side for Android users with big song collections.